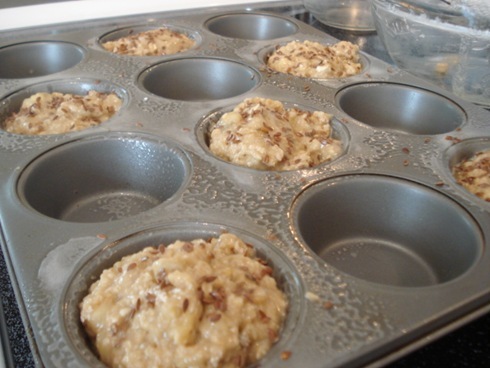 In honor of the blog’s one year anniversary, I wanted to make some sweets, but I thought it should be relevant to the blog, so what better idea than to turn oatmeal into muffins! 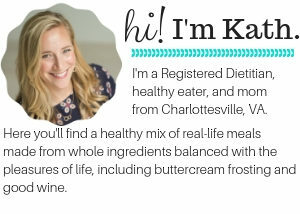 In reality, this is modified from a banana-nut bread recipe from AB’s book but I was able to make it a little healthier and I think it works well! Next, to prepare for later, put the butter in a small bowl and melt it in the microwave. Make sure to do this on a low temperature so you don’t boil off too much water. 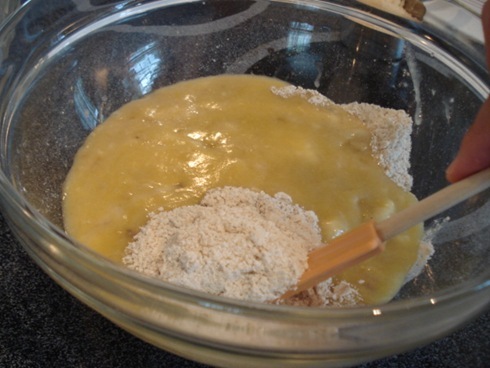 In a mixing bowl, place the bananas, sugar, and splenda together and mash until smooth. I think a whisk works well here. 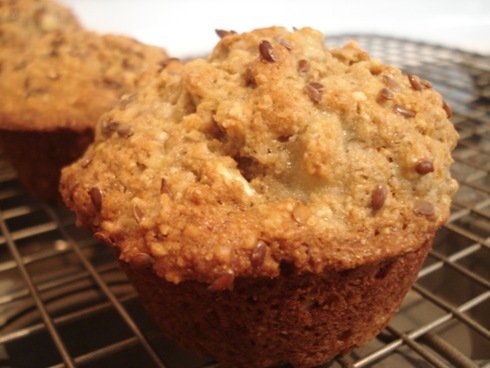 Feel free to leave a few small banana pieces if you like your muffins chunky. 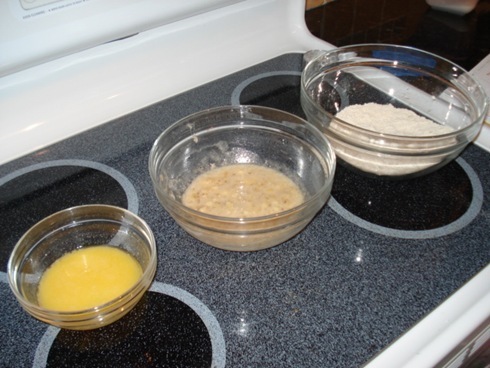 In another bowl, mix your WW pastry flour (feel free to substitute any kind of wheat flour here) along with the oat flour, baking soda, and salt. Give them a good stir to evenly distribute. 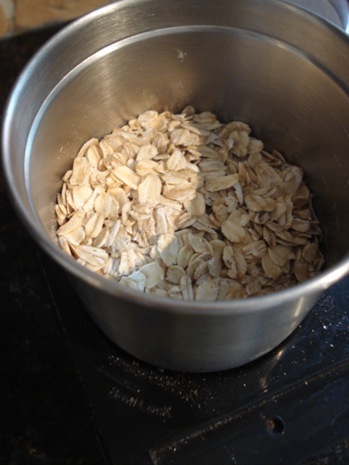 If you’re like me and don’t have oat flour, you can make some out of rolled oats! I used our coffeegrinder to pulverize them into a fine powder. Once you have all the dry ingredients together, get the bowl with the melted butter. Hopefully it’s relatively cool by now. Add the eggs and flavored extract and beat until combined. 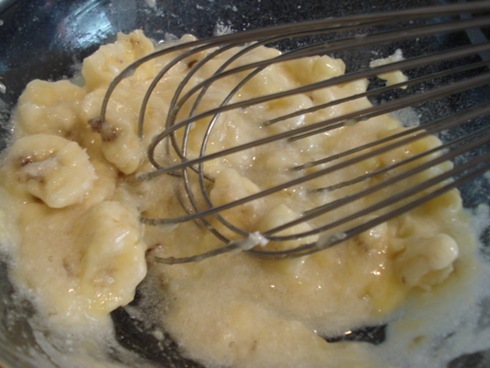 Then, add the butter/eggs mixture to the bananas/sugar, and stir until combined. 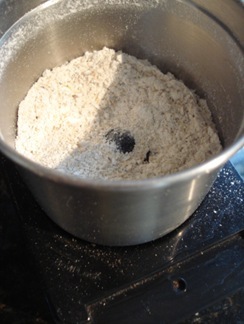 Pour this wet mix on top of the dry ingredients, and fold in using a spatula. 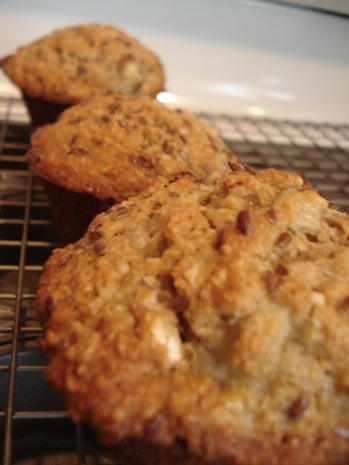 The goal with any muffin recipe is to NOT develop any gluten while mixing. Just flip the ingredients over itself, and once combined (maybe 12 folds? ), it’s time to add the nuts. Again, just fold them in until evenly distributed, and then it’s time to portion them out! Place in the oven in a middle rack and bake for 25 minutes, or until an inserted toothpick comes out clean. Delicious!